Review: I absolutely devoured this book! I had wanted to read it for awhile, basically since it came out. And one of my friends just happened to give me a copy a few weeks ago! So, here’s my review. I like how complicated the world is, and especially how Meyer too the time to slowly introduce you to it. Layer by layer. It made the world real and tangible, instead of confusing and overwhelming. 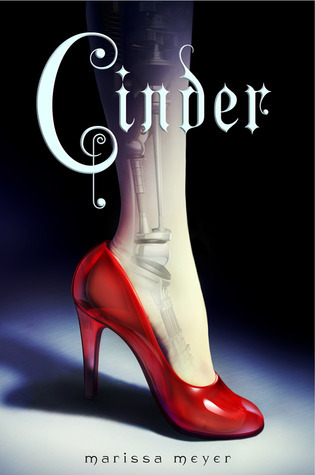 I felt connected to the main character, Cinder, almost right from the start. i think this due to how she was treated by everyone around her, as less than a human. I like that twist as well. It resonates true with our own history (see slaves). I could see the Cinderella story parallel this story throughout the book, which was a great touch! I also thought that Meyer did an excellent job with every character. No one was flat and she left room for growth. Can’t wait to read the next in the series! What an interesting take on this story! Making the cyborg like a slave since they’re both not treated like real people…really fascinating! Could make for a cool analysis in more ways than one… Thanks for bringing this work to my attention!